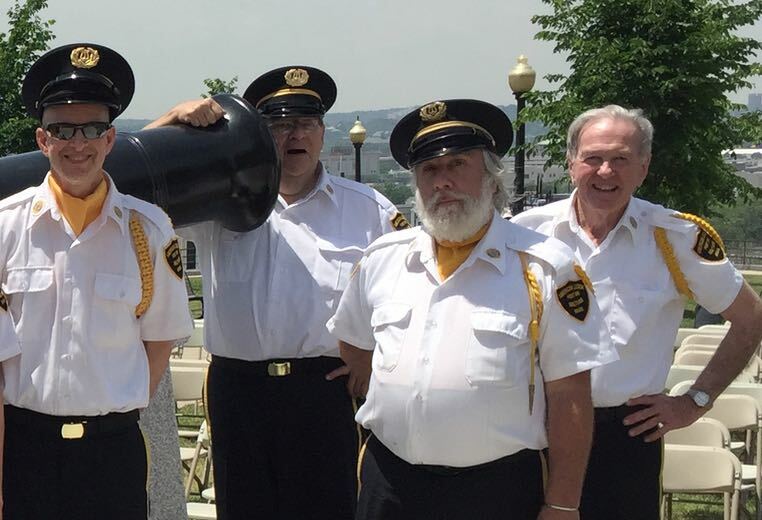 John was unanimously voted in as President during the band's annual membership meeting of 2018. Having been recruited into the band during an Italian Festival, he is often heard singing opera in the hallways of the Legion post. John's first presidential act was to declare that you could hear a concert pitch C, along with the ocean, if you put your ear up to a cannon. John conducts the concert band while driving the musical direction of all events and performances. 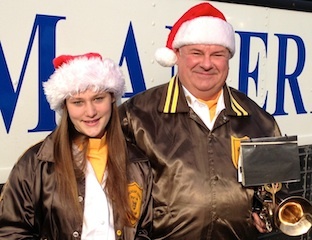 He is a collector of all things musical and for parades, plays one of his twenty four different brass instruments. John attended Boston University as a Music major and at last count, performs in eight other groups. When not blowing one of his own horns, he is sure to offer you a backup instrument out of his car. Shelley is our home town gal and former President of the band. While in that role, she learned to be politically correct while pushing the band out of it's comfort zone and into performances with belly dancers and steam-punkers. Shelly is learning to play the concertina so she can become a gypsy. Bob collaborates with John to set the musical direction for the band. He is the 2nd opinion on all things musical and also plays in a brass quintet. Bob was previously the band treasurer, bringing stability to our finances and keeping us in the black. 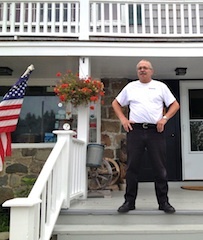 Bob has recently become a grandfather and is enjoying many new additions to his home in Rockport. Judy keeps the band in step coordinating a broad spectrum of responsibilities including performances and logistics right down to snacks on the bus. She has a BA from Trinity College and a Masters from Boston University. 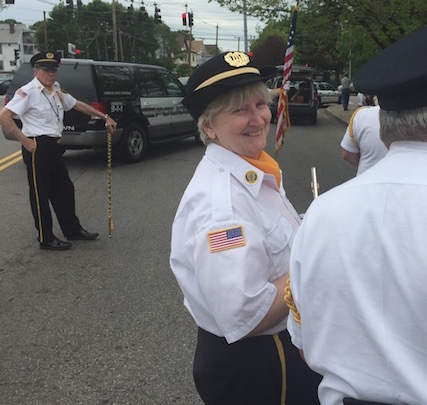 Flute players are flautists in the past tense and Judy has performed as one at Symphony Hall with the Nashua Flute Choir as well as in France and Monaco with the Middlesex Concert Band. As a teacher, Judy handles the reality checks and keeps us laughing all the time - or puts us in time out. 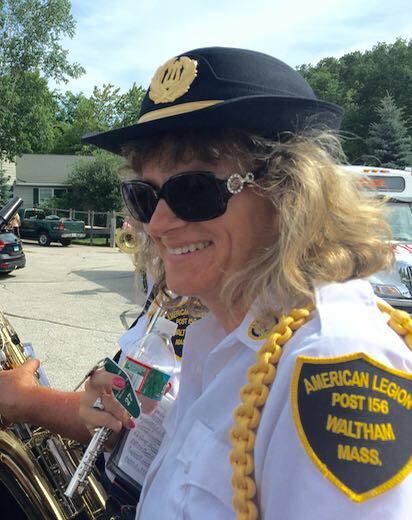 Kathy is the most recent recruit for leading the marching band. She stood still while the other volunteers stepped backwards in the lineup. Kathy's day job is doing good for the world but don't mess with her when it comes to owing money to the band. She will hunt you down and put you away. As the man controlling the money, we all are very nice to Italo. Skilled with a scissors and a snip, Italo is passing on his trade as a Barber while expanding his family business. When not playing the reeds, he entertains with the fisarmonica, known as the Squeezbox here in the states. You can see more of Italo's activities right here on his Facebook page. Dave is an x-biker who decided to retire from gigging with Mick Jagger and play bari-sax with the Waltham American Legion Band. Dave also plays trumpet but we have too many Dave's in the trumpet section. Everett has a tough act to follow in keeping our charts in order but he can reach all of the top shelves. 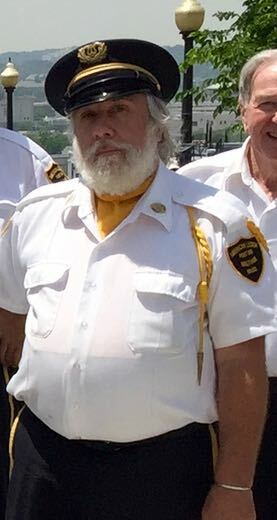 In addition to clarinet, he stands in on bass drum and acts as historian for parades and events. Everett is a scientific type and when not splitting atoms in his basement, he goes camping with his son. 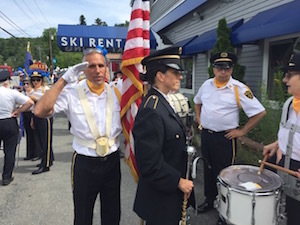 Don brings his Semper Fi to the band as the flag front man standing tall and carrying the stars and stripes forever. He helps to support the efforts of arrivals and departures handling logistics with the bands full transportation fleet of bus and trolley. 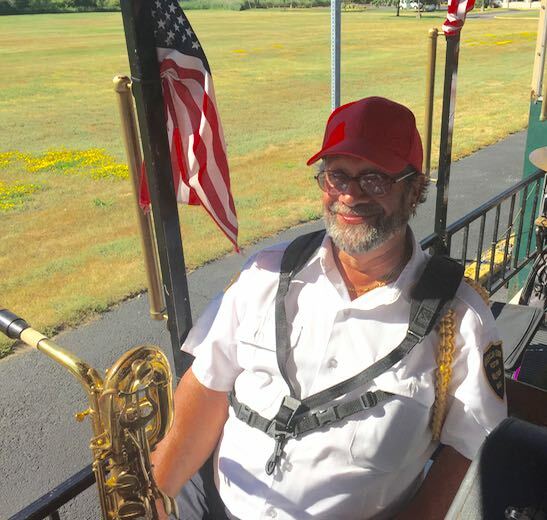 Don has helped the band get from the halls of Montezuma, to the shores of Tripoli always at the ready for handling any engine or mechanical breakdowns. 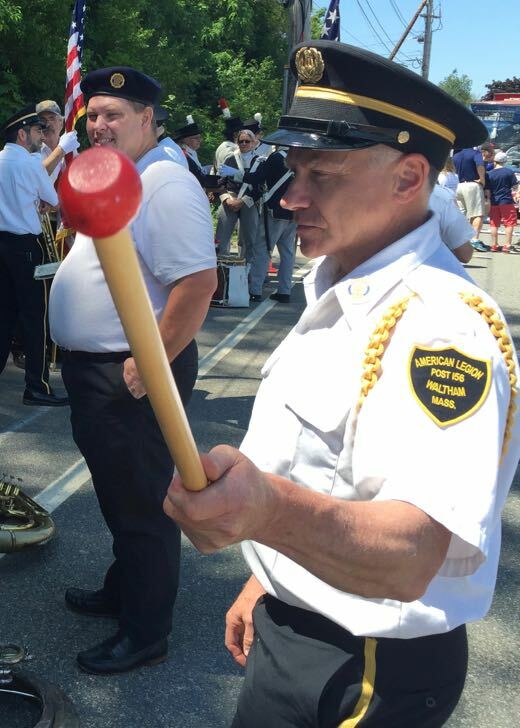 As Drum Major, Bob is our highest ranking official on the street and keeps us in line with a whistle, baton and a left, right, left. 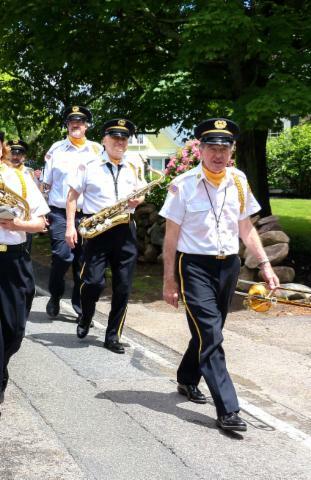 As the leader of the marching band, Bob gets to be first in line at all times - except when we are short in the ranks - which requires Bob to perform a trifecta race of leading, marching AND playing trombone. When Bob is not marching, he's breaking out of the four-four into the three-four onto the dance floor and waltzing the night away.